Use the family calendar to keep track of birthday's, anniversaries and special events. The calendar supports one time or recurring events based various recurring rules. The recurring rules include annually, monthly and a specified date, weekly on a specified day, or monthly on a specified day on the 1st, 2nd, 3rd or 4th week of the month. The calendar also includes a print button which reformats the calendar into list of events. Optionally choose to have the family calendar send email reminders prior to the event. This is a great way to ensure you never forget a birthday or special events and family reunion meetings. Our customers have reported the email reminders have really helped attendance at their family reunion meetings. The family event calendar is included with your Familybelle.com website. The family calendar and website are FREE, if you haven't already signed up Sign up now! Paula was born at 6:12 AM. She was 7lb 4oz and 20 inches. 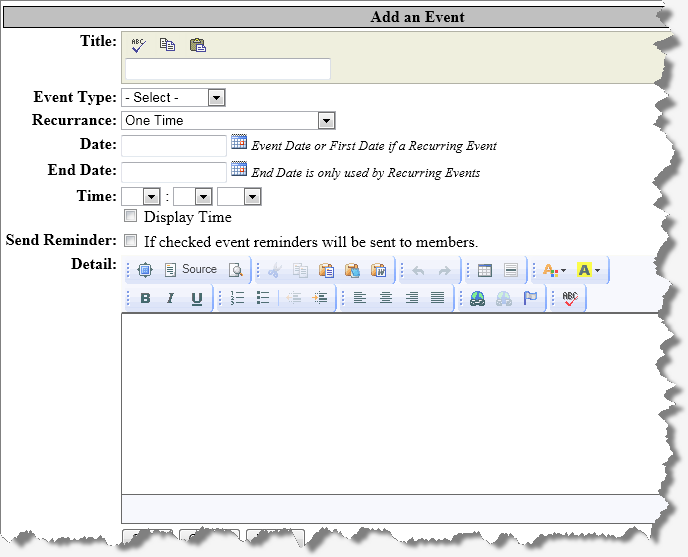 The calendar event tool supports several recurring rules and has a rich text editor which includes spell checking.